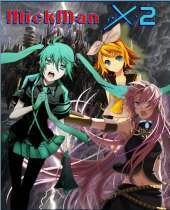 This is the second installment of Mickman X and this time you get to control Kagamine Rin although at the first stage you will be controlling Hatsune Miku for a brief moment. This game is another parody game just like the previous one with Morrigan or Mario as the example of bosses. Now, you get to have 6 stage selection and each defeated boss will grant you the power of the boss itself (just like in the normal Rockman game). And also, did I mention that you get to control Kagamine Rin? However you could also switch to Hatsune Miku in the middle of the game although I prefer Kagamine Rin for her long-ranged attacks (Miku doesn’t have her long-ranged attack anymore).